UNIQUE Intumescent Firestop Pillows are 2” x 4” x 8”. They’re designed to firestop large openings made for cables and cable trays. 3 hour rating. UL classified and made in the USA. UNIQUE Firestop Pillows have all the firestopping features you need to to restore the firewall to protective status when it has been breached by large openings made for cable trays and cables. Our Intumescent Pillows are UL tested and have a 3 hour rating. They are ready to use, easy to install, and stack easily. 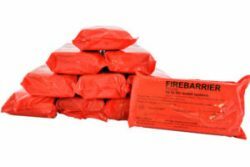 These soft, lightweight and economical firestop pillows are real lifesavers. And because they are self-supporting, they require no mesh, firestop caulk or sealant to install. If you need to reposition the pillows after installation, no problem. They are completely repositionable. UL Classified.